Besides the classic trio repertoire, the George Crumb Trio, formed in 1992 has devoted itself in particular to contemporary music. The combination of woodwinds, strings and piano allows for a wide range of timbre. This musical spectrum is enhanced by the incorporation of the entire flute family from the bass flute to the piccolo. That these instruments were all handcrafted from wood is a novelty and quite possibly unique in the whole world. The long-standing intense work of the ensemble has been recognized not only in their own country but also internationally. Concert tours have led them throughout Europe, Asia and both North and South America. Appearances on radio and TV as well as their CD-recordings underline the quality of the trio. 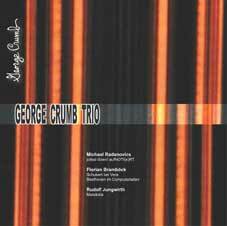 The trio has also savoured partnerships with numerous composers and a wide variety of musical works have been specially written for the George Crumb Trio.